The Datacard® Tru™ Signature solution/software makes it simple to capture a cardholder’s signature and incorporate it on any ID for an additional layer of security. Choose this convenient solution for everything you need to capture, store or print high-quality signatures, including a digital signature pad. Integrate with current Datacard® software. The electronic signature pad and tethered writing stylus ensure consistent, accurate digital capture, so you can expect outstanding results every time. An integrated, interactive LCD panel allows users to see their signature as they sign, which helps prevent errors. The Tru Signature solution/software enables fast, high-quality capture as well as digital archiving and printing of electronic signatures. 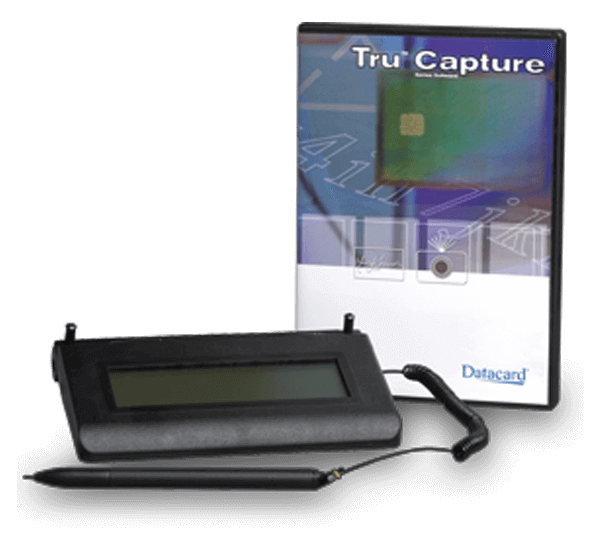 The Tru Signature solution comes with Datacard® Tru™ signature solution/software for seamless integration with the Datacard® ID Works® identification software and ViaNet® identification software families.